Located in a quiet, tucked away area of Crossland Moor is this low maintenance one bedroom apartment which is well proportioned internally and benefits from off road parking and private garden. 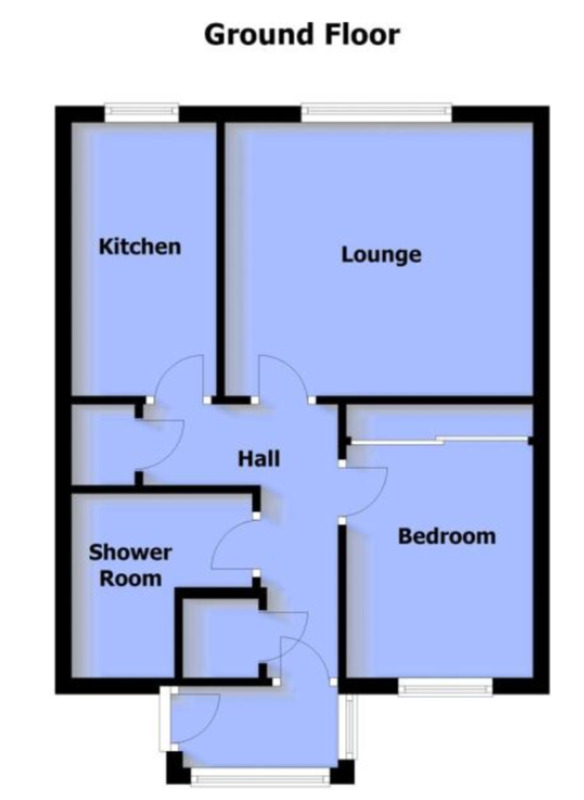 The apartment briefly comprises; Lounge, Kitchen, Bedroom, Shower Room. PORCH Presented with fully tiled floor and glazing to two aspects, the porch has a glazed door leading to the reception hall. RECEPTION HALL The reception hall allows access to all rooms within the property whilst having 2 large storage cupboards and an electric radiator. LOUNGE 12' 7" x 11' (3.84m x 3.35m) A well proportioned and neutrally presented reception room, the lounge is positioned to the rear of the property and has a pleasant outlook over neighboring gardens through the double glazed window. The lounge features an electric fire set into a feature surround, coving to the ceiling and an electric radiator. KITCHEN 11' x 5' 10" (3.35m x 1.78m) The kitchen features a range of wall and base units which are topped with a roll top work surface that incorporates a stainless steel sink and drainer unit with mixer tap over. Appliances include a built in electric oven with four ring hob and extractor over (other appliances can be negotiated). The room is finished with a fully tiled splash back, spot lights to the ceiling, electric radiator and a double glazed window to the rear. BEDROOM 11' x 9' 3" (3.35m x 2.82m) Positioned to the front of the property, the bedroom is a good size double which benefits from a range of mirror fronted built in wardrobes, creating ample storage space. The room has a double glazed window, coving to the ceiling and an electric radiator. BATHROOM A three piece shower room comprising a range of modern fitments including a double step in shower, pedestal wash hand basin and a low flush W.C. The room has full tiling to the walls and a vinyl finish to the floor, there is also an opaque double glazed window to the front aspect. EXTERNAL To the front of the property is a useful storage area as well as allocated off road parking and a private, low maintenance garden. ADDITIONAL INFORMATION Mains Electric, water and drainage. The rent will be £395.00 per calendar month payable in advance. The tenant will be responsible for the payment of utilities and council tax. The tenant will pay a bond of £495.00 which will be repayable at the end of the tenancy provided that there has been no breach by the tenant of his obligations under the agreement, the property has been left in satisfactory and clean condition and that there are no breakages or damage to the property, fixtures and fittings or furnishings and that all outstanding accounts with the statutory undertakers have been paid and receipted, final invoices for the same have been produced to the Landlord or their Agents. The tenant will be responsible for maintaining the gardens. The tenant shall be responsible for the electricity consumed, together with telephone charges. (The tenant will be responsible for arranging reconnection and cost of the same). Application forms are available from the Agent. References will be required.